ONLY 2 weeks available for Summer 2019! We are a DOG FRIENDLY rental home with some simple stipulations (leash walking, clean up, shots,) for your dog. This rental is great for families with children and grandparents. One of the master bedrooms is on the first floor if you don't want to climb the stairs. Three of the four bedrooms have private sinks and toilets. There's a large outside shower that guests love. An enclosed sunporch to read the paper in quiet relaxation. The kids can be by themselves playing games or watching their shows in play area upstairs. The rooms are spread out and large enough to accommodate many in your group, giving all their 'own space' as needed. You can walk to the beach or just one block to the 74th Street playground. Great for young ones! Teenagers can walk to the recreation courts on 80th street or possibly the 20 blocks to Stone Harbor shopping. Adults can take classes at the recreation center just 5 blocks away. Our beach is wide, beautiful and quiet, just a one and a half block walk. So, bring the grandparents, the kids and the dog to have fun in the sun and play at the Jersey shore! Hardwood flooring throughout the home. Updated kitchen with quartz counters, glass backsplash, updated cabinets and all new appliances in 2015, including washer and dryer. New mattresses/pillows in all bedrooms. including 2 upper decks and patio outside with dining area. Private baths in 3 of 4 bedrooms. AC and ceiling fans throughout. Plenty of parking - 4-6 on property plus easy street parking. Rates for 2019 will be $ 4950 per week. Pet fee = $ 200 plus refundable security. If interested, please contact me by phone or internet - oceandrive7523avnj@yahoo.com. Let's connect before you send any money. 610 . 637 . 7545 Thanks. We've owned and rented the property since 2000 and make improvements every year. We continue to accommodate our renters and have had no complaints. Because we use the home when it is not rented, we upgrade it for our use as well. We see when items need to be changed or fixed and do our best to address upkeep. It is a comfortable and easy home, making your vacation truly relaxing. We continue to have returning renters year after year. These families who want to rent year after year are a testament to the home's accommodations and comfort. 3 of the 4 bedrooms have private sinks and toilets. The first floor master bedroom (queen bed) has a private bath with a shower. The 2 large upstairs bedrooms (one has a king and one has a queen bed) (also with walk-in closets) have large vanity and sink set separately in the bedroom with private toilet rooms. These 2 bedrooms share the shower via a jack and jill arrangement. There is also a large outside shower. The 4th bedroom on the first floor with a double and a twin bed use the full bathroom in the hall. This bath has a tub shower. One can walk to Stone Harbor for shopping, restaurants and night life. Stone Harbor Recreation Center is 5 blocks away. Trolley transportation is available for activities in Avalon and Stone Harbor. We have a line at the house, but have no phone plugged in due to solicitation calls. Plenty of parking.... 4 + in driveway. Corner property has parking on both streets. New stove, oven and microwave in 2011. Salt and pepper, herbs and spices are at the house for your use. More than you need! Well accommodated for all of your family. Martini glasses, plenty of wine glasses and fun plastic drink glasses for outside. Blender for happy hour concoctions! Kitchen was renovated in 2015 with updated cabinets, quartz counters, Silgranite sink, beautiful glass backsplash. Large kitchen layout with all amenities and almost all appliances you could ask for. You can fit 10 at the dining room table and 4 at the breakfast bar. There's another table on the enclosed porch which seats 6. Dining room table opening - just pull apart and lift leaves. Large 60" 4k Smart HDTV in living area. TV’s in every bedroom. 2 additional Smart TV's. There are two second story decks with lounges and seating. One accessible from 2 upstairs bedrooms and the the other via spiral stairs off the living area. Share views of the ocean and the sunset. 2 Second-story Decks to relax and lay out on or view sunset, Rear ground level patio/deck with seating area and dining area with tables & chairs, 5 Cable TV's, Dvd player, Hardwood Flooring throughout. Large bedrooms Ceiling fans throughout. Newly renovated, large kitchen with all amenities and small appliances, Gas and Charcoal BBQ Grills, Very Large Outside Shower, Plenty of Parking, Separate Play Area for kids upstairs, Enclosed Back Porch with all windows, comfy seating, extra refrigerator, Wide quiet street & beach, No Smoking inside please. New stove/oven/microwave, new outside patio furniture. Great place for extended or large family. Our stay at this enchanting shore home was easy-living time. Lots of room which meant the kids and grand-kids had space to themselves when needed. (Or when grandma and grandpa needed it!). Close to the ocean beach as well as the bay; and a park was also adjacent. Gramps loved the spiral staircase to the roof deck--to play with his telescope and the night sky. We don't fish--but apparently it is a good place for that, too. A restful and pleasant stay. Our kids and dog loved this vacation! 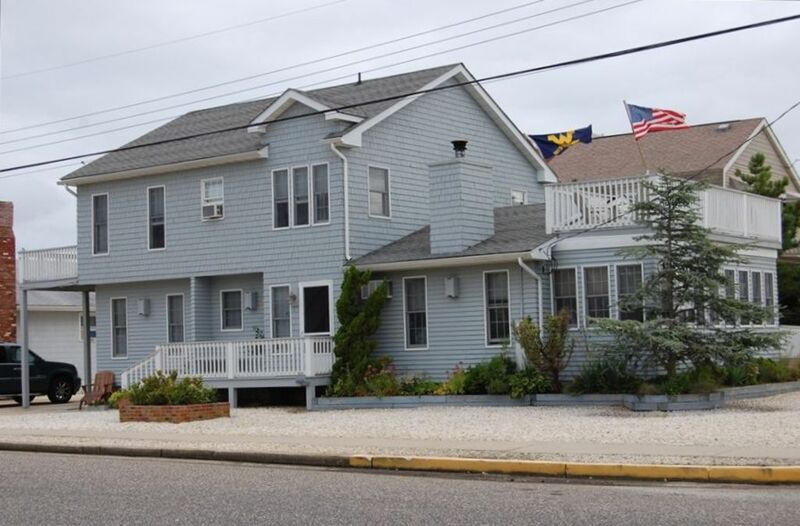 Had a great time enjoying this pet friendly home with all the amenities and just a short walk to the beach or downtown Stone Harbor,,, we'll be back! The house is well maintained with good amenities and only 2 blocks from a white sandy beach. There are a number of porches/balconies to relax on. Dog friendly is a big plus. Had a great time with my family. A great kid park is a block away and the non-crowded beach is 2 blocks. Restaurants, shops and ice cream in Stone Harbor is close by too. My kids love the collection of kid movies. Lots of paperbacks for us too. Overall a well cared for home. We'll be back! This house has it all. Walking distance to fantastic Avalon beach with body surfing and boogie boarding for kids and grown ups alike. There are lots of things for families and children to do. There is a great park nearby, amazing free Cape May zoo and a several boardwalks very close. We loved the outdoor deck, BBQ, and nice outdoor eating area. The outdoor shower was also a real treat. The house is very well laid out and spacious with essentially 3 master bedrooms. This house made out first trip to Avalon very special for having a large family get together and was especially comfortable and cozy. This house was only one and a half blocks from the beautiful beach. Lots of rooms and room to spread out with a large family or group. Very comfortable--comfy beds.... I would go back any time. My Oregon grandson visited the Jersey shore the first time and totally loved it--- this house made it a super memorable experience! thanks so much for your review... hope your family from Oregon can come to the Jersey shore again soon! ONLY 2 Weeks available for Summer 2019: 6/22 - 6/29 8/17 - 8/24 Rate is $ 4950 per week.